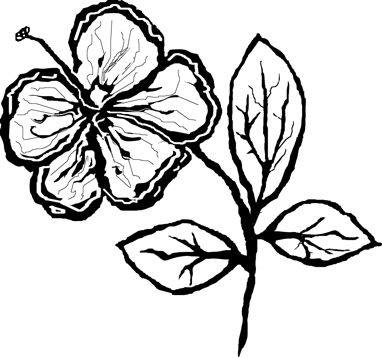 Maybe it’s because I find it easy to draw a hibiscus? This week has been filled with that Hawaiian beauty, and I am not tired of it yet. It started on Wednesday when I joined the “Fab Five” (my practicing art quilt group) for a day of exploration. We were focused on stenciling, stamping and generally creating designs with all sorts of tools… even gelatin. The most fun for me was the glue gun. 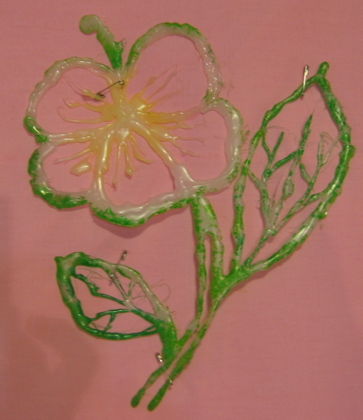 A piece of parchment paper served as a base and a hot glue gun (careful now!) 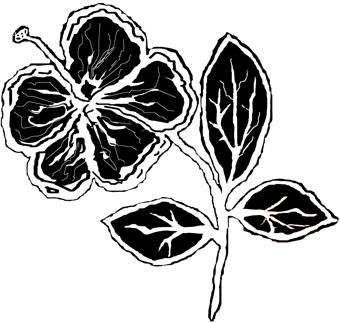 created a hibiscus design that I could use as a stencil or stamp. It is white when first completed… this one has been used to create a design and retains some of the paint. It can be trimmed and is so easy to work with. Hope the Off the Wall Friday group enjoys seeing this process below. After quickly applying some fuchia setacolor paint to a piece of muslin and letting it dry, I held the glue stencil securely on the fabric and dabbed paint around it. The result has a batik quality. I’m eager to try my hand at a few more of these. Good times. A friend, neighbor, and excellent teacher also has some lessons that many of you might enjoy. Lyric Kinard is teaching her Bead It Like You Mean It class right now. Get on over to her blog and have some fun while you learn how to use beads on fabric. Her instructions have provided me with hours of pleasure, both in class and from watching her DVDs. Using some of her methods, I will be adding some beads to my hibiscus. She also creates thermofaxes, so I decided to see if I could use the glue stencil to create a couple of thermofax designs. 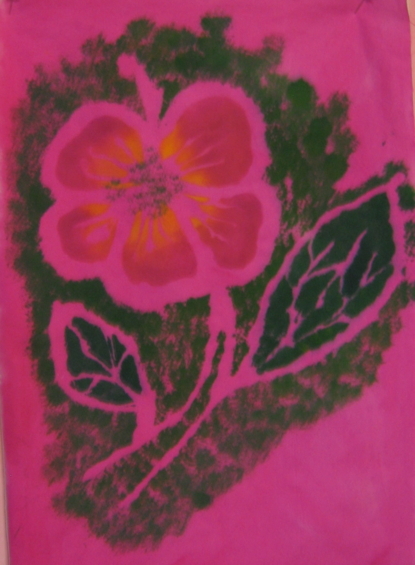 I put the glue stencil on the scanner and used my photo editing software to work with it. Here are the results – a positive and negative thermofax. Thermofaxes are created from black and white images placed on a thermofax printer. 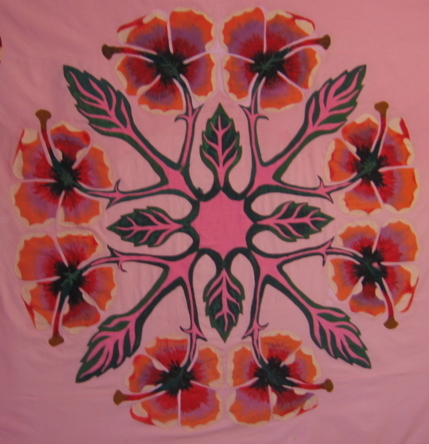 I still have the hibiscus quilt on my design wall. I worked on the leaves this week, and I hope to have all of the painting completed in only a few more sessions. 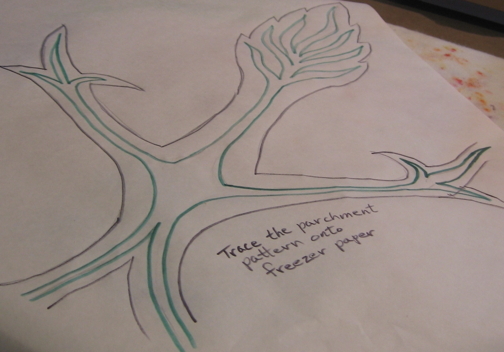 After drawing a pattern on freezer paper and pressing it in place on the quilt top, I applied two colors of green setacolor opaque paint. There will still be a light green color that will trace the veins which are now bright pink- applied with a sponge. Touches of the pink will peek through. It is exciting to see it take shape…. still much to do. Guess it’s been a productive week! Hope to catch some more activity happening over at Off the Wall Friday! Come along and check it out with me! This entry was posted in Copyright© 2009 All images and text in all categories are copyright of Mary A. Ritter (aka M'Unique) and may not be reproduced without express permission., Fiber Arts and tagged glue gun, hibiscus, lyric kinard, paints, setacolor. Bookmark the permalink.